Who knew the hardest part of this redo would be the flowers… My right brain had this great vision in my head and would not allow my left brain to work. I never was a math major and every time I have to do algebra/geometry things I hear my high school math teacher telling me if I would just take the book home I could make A’s & B’s. Sorry I should have listened. 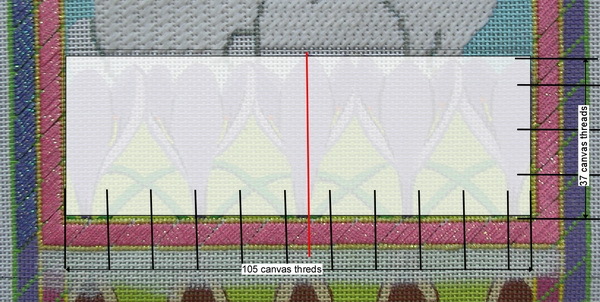 I began by counting the threads in the width of the area between the borders (105 canvas threads) and I counted the height threads from bottom border to bottom of bunnies (37canvas threads). I wanted to symmetrically place the flowers across the bottom, and I knew there probably should be an odd number of flowers since that was what had been painted in the original…don’t want to mess with the aesthetics of the design. I decided to divide the width by three and start with this…but that did not compute, my flowers would have been as wide as they were high. 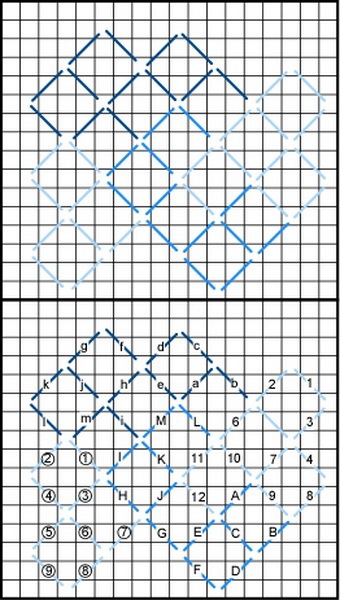 Then I decided on five across, this would work the flowers would be 21 threads wide. 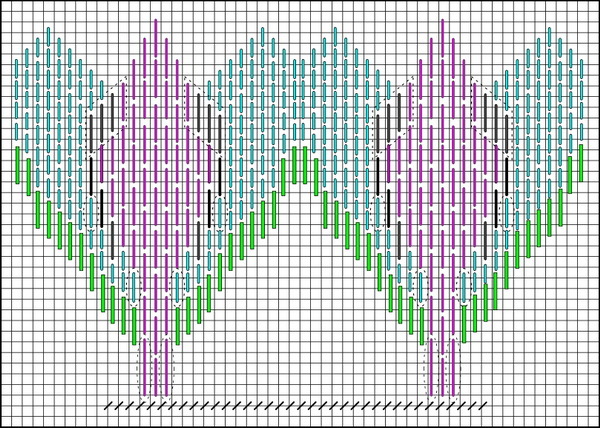 Finally I decided that if I charted the flower as my mind was seeing them then I could tweak the design to fit. Then I also thought about counting the width of the flowers that were already there, but I had painted over them and that was going to be difficult. But as luck would have it, at 2 AM I woke up with the thought that I could count these flowers from a picture I had taken before I painted the canvas white. These 2AM wake up calls are not very welcome but they usually are the easy answer to a nagging question., I have been known to get up and see if the 2 AM idea would work; lucky for me this time I could go back to sleep. The next morning I counted the flowers and I realized the original design had three full flowers and two partial flowers on the ends. So I figured I had 4 flowers across (3 fulls + 2 halves= 4 flowers…105 threads/4 flowers = 26threads per flower. 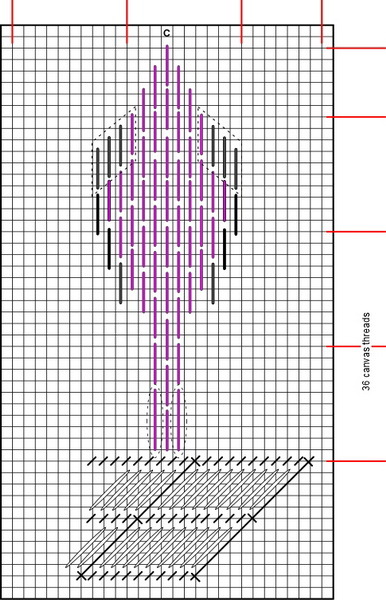 So I am using my computer to develop a pattern for a flower about 26 threads wide by 36 threads high. Since I know I wanted the center to be over 4 canvas threads this was a no brainer…I would have nine stitches over 4 threads, a place to start. Figuring out the flowers is not as easy as I thought it would be. I think I have figured out the center and am going to work on the outside petals. 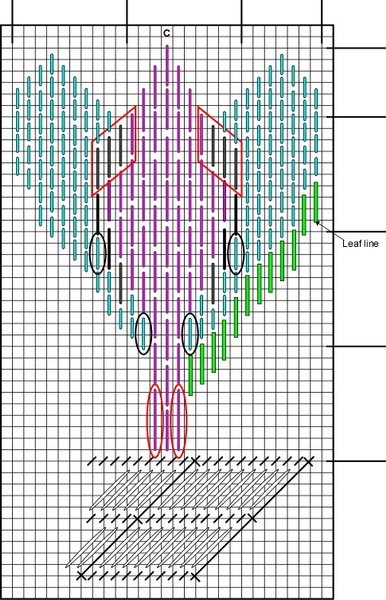 I think I want the outside petals to be over 2 threads but I need to chart the sides and begin stitching a flower to be sure it is going to work and how it looks. I know I will need three full flowers and two half flowers. If I get the three full flowers in and have at least the better part of a half flower on each end I will be happy. I’m off to compute the rest of the flower and try stitching one to see how it looks. Hope this doesn’t turn into a brain blocker for me. But stitching time is great. Worked on Mom and Me border for the past week and am almost finished. Here’s the chart I developed for the corners. 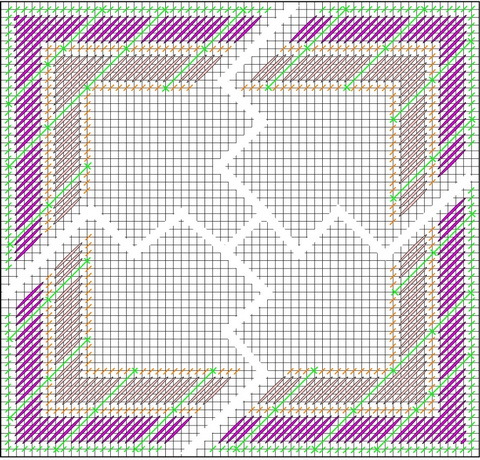 And the border is set; all I have left is a bit more purple and most of the green. 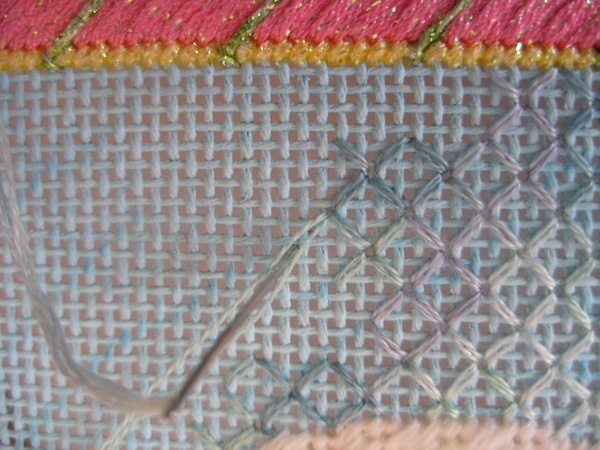 It takes longer since I am laying the RG Petite Sparkle Rays thread on both the front side and back side of the canvas. This takes more time but I think with the ribbon type threads it makes for a smoother appearance. Sometimes when I work with these ribbon threads I think when they turn on the backside you get a bit of a different light play on the thread and I sometime can see the edges curl. It may be just me, but when this happens and I go back and look I can usually see on the back where the ribbon thread has twisted. And wouldn’t you know it the Kreinik braids I choose to use are two of the ones being retired. In case you have not heard, Kreinik (http://www.kreinik.com/PDF/special_order_colors_release_2014.pdf) has designated 43 colors as “Special Order” colors. 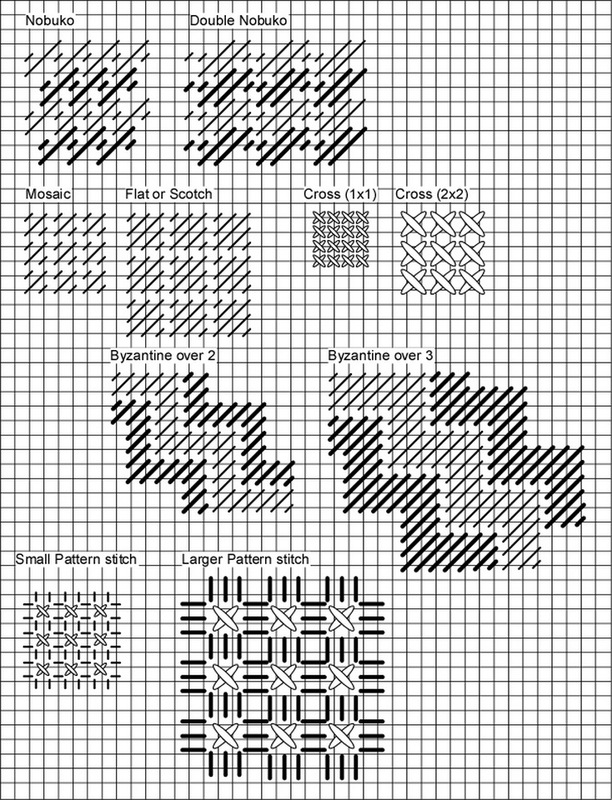 Oh well I am sure there are other colors that will work just as well and maybe if you are planning on stitching this piece, you have these in your stash. 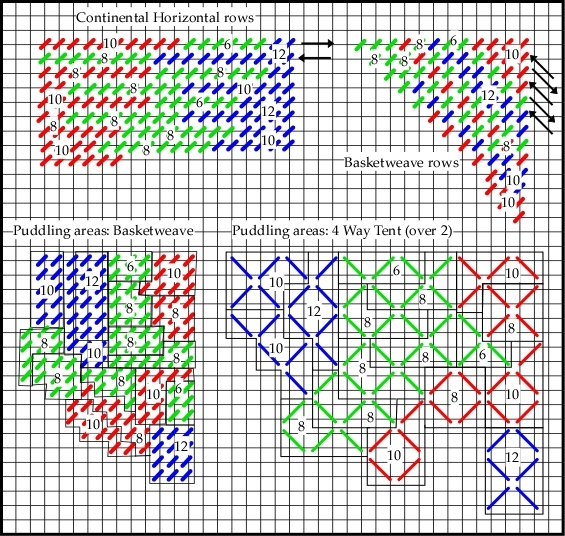 But this is often the story about many threads used in designing…by the time we get the designs/stitch guides to production a thread can be discontinued. I’ve always said if you do not like a thread or color that is chosen or used in a stitch guide, change it; same goes for a stitch. 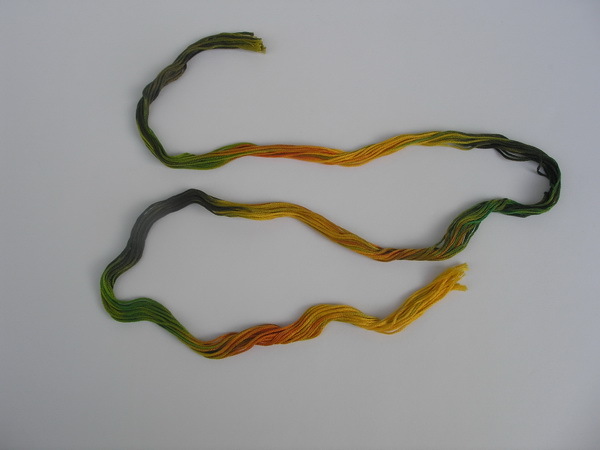 There are other threads that will work just as well and some are from the same manufacturer. 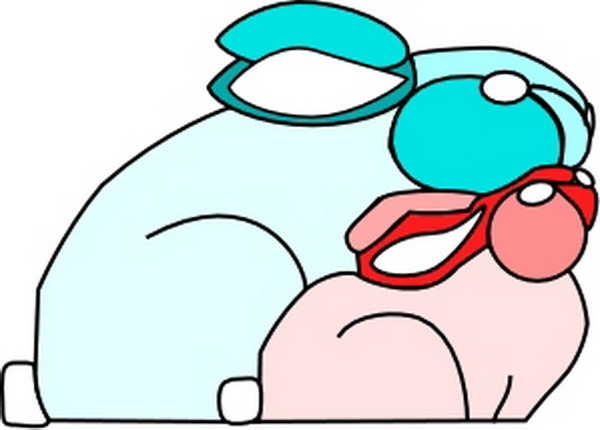 Threads and stitches can be changed…IT IS YOUR PIECE! 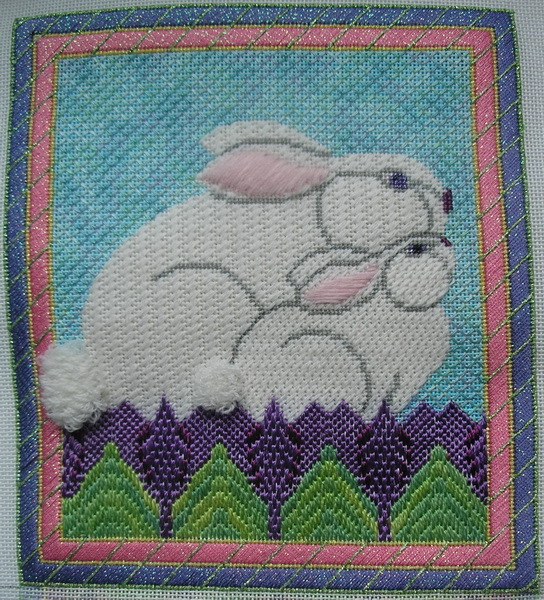 Back to Mom and Me…as soon as I finish the border am going to stitch Mom and me bunnies. 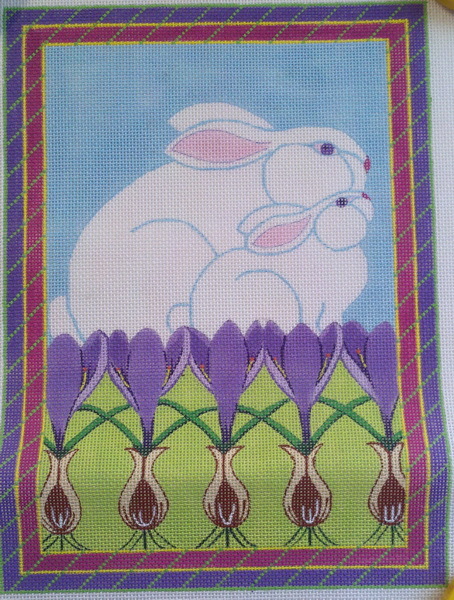 And I am playing on the computer to figure out the flower pattern I want to use below the bunnies. I know the width and am guess-ta-mating the height. But for today I need to get outside and enjoy the day…Long spells of freezing cold temperatures have affected me more than Cabin fever…need to feel that warm sun on my rosy cheeks and the warm breezes beneath my feet. 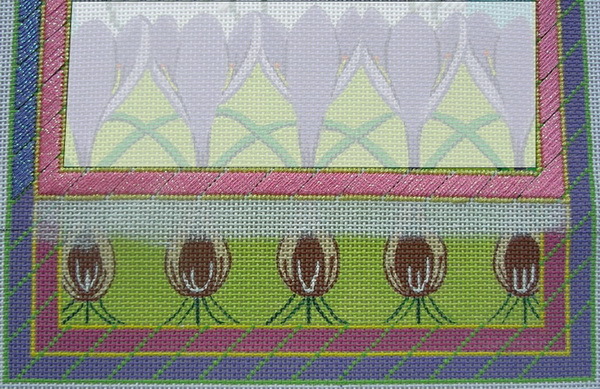 I always like to have a canvas of the season to stitch, so I’m starting a new/old project. This is an old canvas from Beau Jeste; I always liked the top 2/3 of this canvas but the bottom third not so much. Anyway the canvas was given to me by a fellow stitcher and so I decided to alter the canvas to fit my needs. 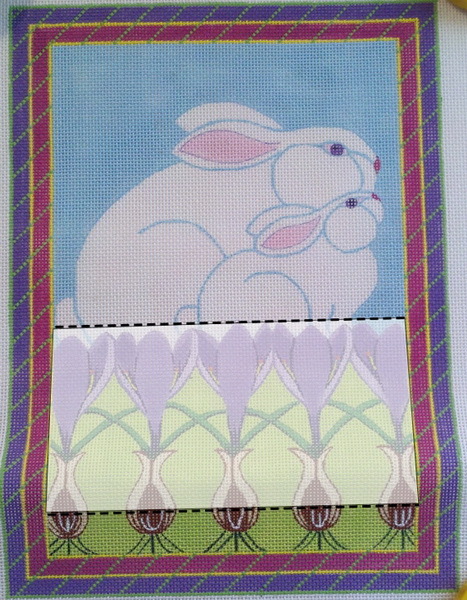 I wanted the border to also be symmetrical and that meant the opposing corners needed to match. 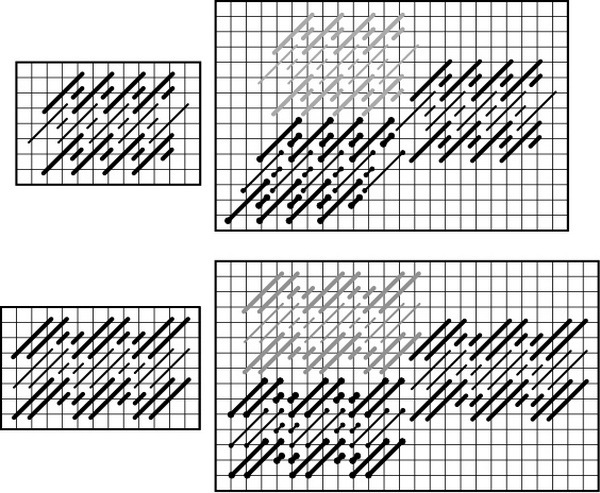 I’ve drawn on a picture of the original canvas how I expect the corners should look and where I need to paint out the canvas…see circles with green lines and dashed area. 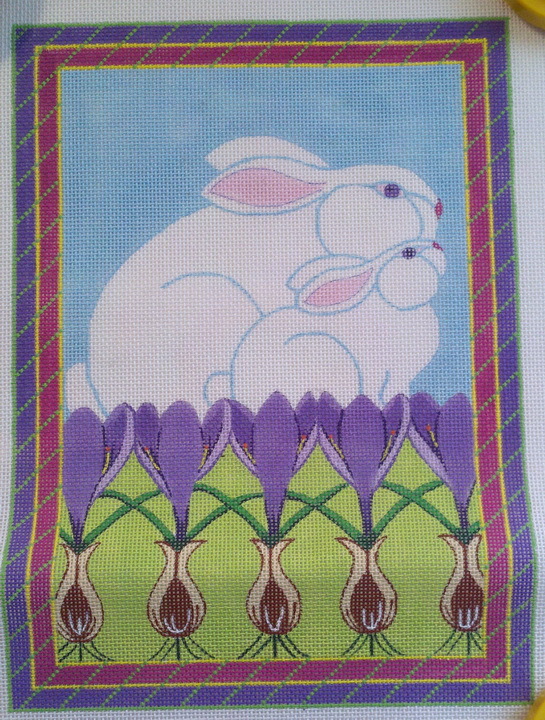 I also noticed that the crocus at the bottom are not symmetrical or centered; so I decided to white them out too. 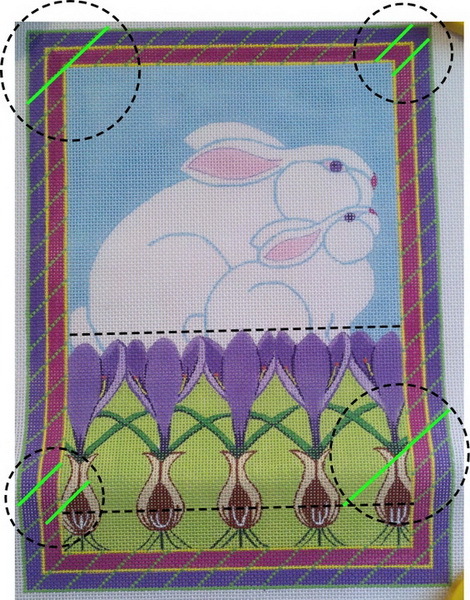 I will develop a pattern using the computer to fill the flowers back in. The dashed lines show the area to be whited out. I used Liquitex acrylic white and whited everything from the bunnies down. 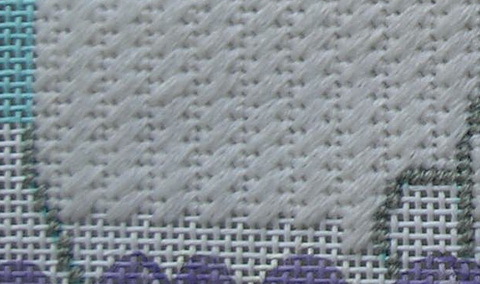 I did not need to cover the canvas well as I am going to use the purples to stitch the canvas. I just wanted a semi-blank canvas to stitch over. I will allow the canvas to dry for a couple days. I don’t usually like to stitch the outer parts of a canvas first but I needed to establish the border before I know how many horizontal and vertical threads I needed for the flowers. 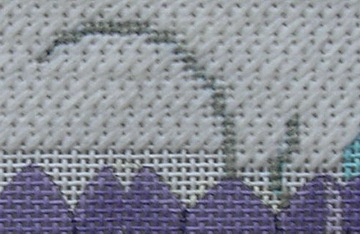 I’m going to start stitching the inner borders first.